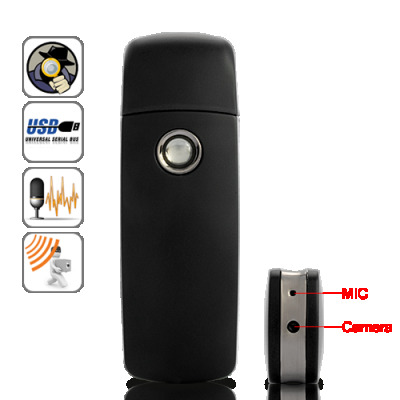 Successfully Added USB Flash Drive Camera DVR (Motion Detection, 4GB) to your Shopping Cart. Designed to look and work just like your normal USB flash drive, this camera covertly records videos and audio at 30 FPS and 720x480 resolution. It also takes JPG format still photos at high definition 2048x1536 resolution. Best of all, whatever captured by the camera will store directly onto the included 4GB microSD card for convenient playback. Worried about your day carer not taking good care of your kids when you are away, or your employees not working hard when you are not watching? Simply leave this flash drive camera at the dining table or work station and it will record what you want to see. It even comes with motion detection function so that it records everything that moves within its range. With it's inconspicuous shape and design, there's no way others can tell it's actually a hidden camera, so away with this USB flash drive camera! This USB flash drive camera is excellent for citizen journalists to record under-the-table deals, private investigators, or just anyone who wants to have some fun. The uses are unlimited and with the included 4GB micro SD card, you can store hours of video to review and use for later. Better yet, if 4GB isn't enough, then insert your own micro SD card (up to 16GB) and keep on recording! this compact and sleek USB flash drive camera is now available for immediate shipment worldwide. Purchase bulk quantity at discounted wholesale price to sell and lock in some amazing profits. Brought to you by the leader in direct from factory electronics, Chinavasion. I would like to know whether this product has a Date / Time stamp - does anyone know ?